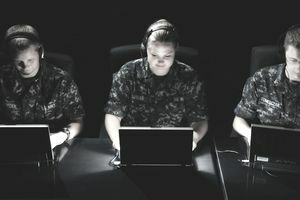 A U.S. Navy Cryptologic Technician Networks (CTN) rating performs a host of duties associated with computer operations across global networks, according to the U.S. Navy. The rating, which went into effect on Feb. 6, 2004, is designed to develop a skilled workforce further to meet fleet requirements in computer network defense and other operations. It also supports the Chief of Naval Operations' guidance to transform information operations. To become a CTN, you must acquire both technical and analytical computer network skills. Initial training is located in Pensacola, Florida for about six months. Advanced training in computer network operations, using state-of-the-art technology. A combination of technical and analytical computer network skills that provide the situational awareness required to develop and carry out informational operations (IO) actions/counteractions. Defend against external and internal threats through in-depth technical and non-technical methods. Network Vulnerability Assessments and Incident Response/ Reconstruction. Active computer network defense, access tool development, and computer/network forensics. CTNs are assigned to computer networking system departments and divisions to either day or shift work in a large facility. They can also be assigned to one of the individual or two-person independent duty assignments at sea or ashore. Departments and divisions are usually divided into specialized mission area shops. Candidates must be a high school graduate or equivalent (GED, CPT, home study or other equivalency). If not a diploma graduate, the applicant must provide a high school transcript verifying successful completion of the tenth grade. How Are Career Paths Defined? Due to the unique nature and specific skill sets required by sailors in the various Cryptologic Technician communities, career paths are defined by INCONUS (inside the U.S.) and OUTCONUS (outside the U.S.) tours, instead of sea/shore rotations. Sailors serve on various tours outside the continental United States and/or overseas tours, which counts as sea duty. CTNs can expect a rotation of one INCONUS tour, followed by two OUTCONUS tour, etc. Until CTNs reach the rank of E-8. E-8s and E-9s, they can expect a rotation of one INCONUS tour, followed by one OUTCONUS tour.